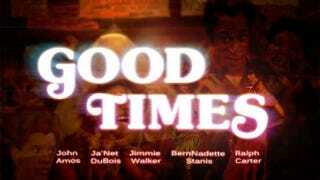 Good Times provided many people with something that was missing from television in the ’70s, but when the show ended its run, it didn’t quite give fans closure. And that’s something the original cast (minus Esther Rolle, who has since died) wants to provide. BernNadette Stanis, Jimmie Walker, John Amos, Ralph Carter and Ja’Net DuBois aren’t using a big Hollywood studio to fund a movie based on the show instead they have created a Kickstarter campaign to which the public can donate. According to Deadline, the cast members’ attorney, Shaun Weiss, says the movie won’t infringe on any copyrights or trademarks from the original Norman Lear show. But one has to wonder, with a $1 million goal and, so far, less than $5,000 raised, are their goals too lofty, with 15 days to go? It’s also interesting to see that Amos will be involved somehow in the project, especially since his character was infamously killed off the show because he didn’t agree with Lear’s vision. With news last year that Lear was planning a reboot of the series (yes, another reboot of something that shouldn’t be rebooted), the attorney for the cast says that their movie will be nothing like the old series.